Google recently paid tribute to late legendary actor Madhubala, with a beautiful doodle in order to celebrate the 86th birthday of the actor. Madhubala is best known for her role of Anarkali in the movie Mughal-E-Azam opposite Dilip Kumar. Her contributions and roles are praised even after years and is counted among the greatest actor to grace the industry with her talent. 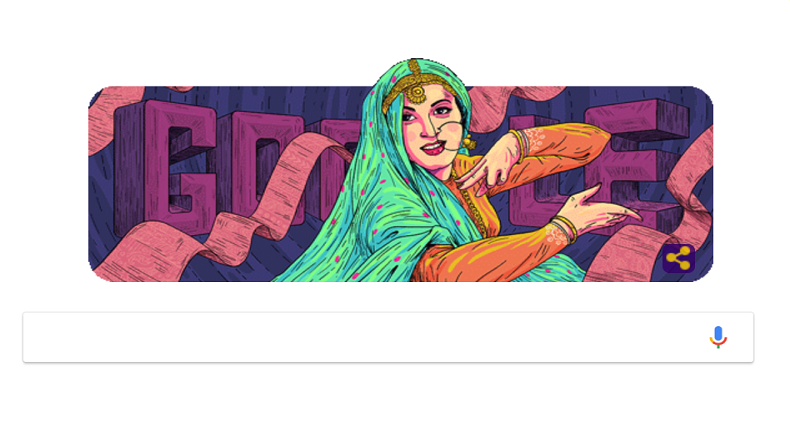 On the 86th birthday of the iconic actor Madhubala, Google honours the legendary with its doodle. The artist of the doodle is based out of Bengaluru– Muhammad Sajid and has done a brilliant job, creating a beautiful sketch of the gorgeous actor. The Marilyn Monroe of Bollywood, Madhubala was known for her style, glamour, beauty and her soft portrayals of women in her films. The actor was born on February 14, 1933, in Delhi and raised up in various slums of Mumbai. The hard worker made her on-screen debut when she was just 9 years old. She further got an opportunity to play a lead role in the movie Neel Kamal when she was 14 with her costar Raj Kapoor. At a very small age, the actor began to support her family and was also known for spreading the magic of her talent and beauty on-screen. Till 1949, the actor appeared in a total of nine films including her blockbuster performance in the movie Mahal. She gained popularity and stardom after appearing in the movie Mughal-E-Azam in 1960 in the role of Anarkali. Even after years, she is still praised for her chemistry with her on-screen partner Dilip Kumar as Salim. The beauty finally took a step forward and married to the famous singer Kishore Kumar in the same year but unfortunately, they both got separated due to her death in 1969 because of heart disease. Though she passed away, the contributions that she gave to the industry and her iconic roles are still appreciated and praised.